I just added a roof rack to my Taurus X tonight. 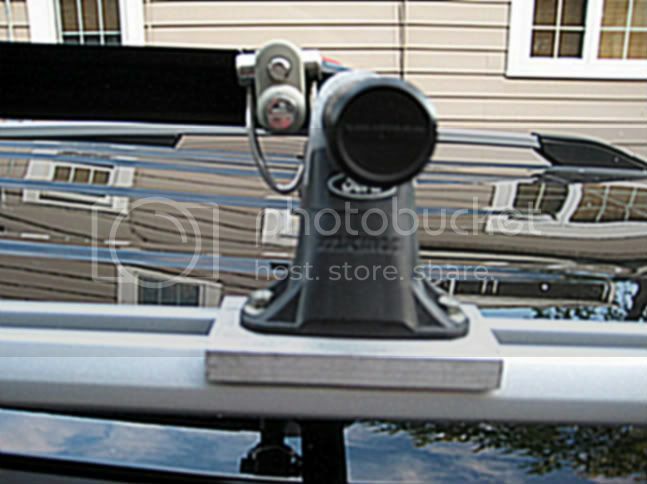 I couldn't find any mount by Yakima that worked along the entire lengths of the Taurus X roof rail. My car has a sunroof and I didn't want my bikes or other gear mounted directly above the sunroof. I used a Ford-branded Yakima Rack that I recycled from my old Ford Windstar. The Ford Part Number F77Z-7855100-CA KIT - LUGGAGE RACK. They also sell the same one on Amazon. Unfortunately, the mounts are too narrow to fit on the wide channel of the Taurus X. I found a piece of 2-inch wide aluminum channel that happened to be the perfect width to lay on top of the Taurus X roof rails. I cut the channel into 4 pieces and drilled 2 holes to place under each of the mounts. The Ford/Yakima rack came with "A Plates" which are too small to grab the inside of the channel. I ended up getting some 1 3/8" (or 35 mm) diameter washers to help anchor them in place. I placed the washers between the roof rail channel and the A Plate and I bolted everything together with 25 mm long fasteners. I ended up using 4 aluminum channels, 8 washers, and 8 fasteners to make it all work. Everything seems to hold together pretty well and I was able to reuse all my Yakima hardware from the Windstar. I purchased the washers and fasteners from Graingers. I read some of the other posts and it looks like a "C Plate" would work better than the "A Plate." Does anyone have the dimensions of the "C Plate" ? The 35 mm diameter washers seem to work great. I might order some C Plates or I might try and weld the A Plates to the washers to make them more robust. I also was disappointed that there were no crossbars with my shiny new Taurus X when I picked it up. However I liked everything else about it so went through with the sale. I bought the Yakima bars, control towers and landing pad 4's. The dealer installed them. I wasn't thrilled with the fit of everything and reading the posts here had me more concerned. This is what I am doing/have done. The machine shop guys looked at the set up and recommended longer bolts, I have order 30 mm stainless steel bolts WITH nuts. It is surprisingly hard to find these where I live (which is very industrial). This was the main concern the guys had. At my request they made nylon washers to fill in the gap, similar to the A plate discussion. Hopefully I can install this on Saturday (if the bolts come in!) and let every one know how it works. The guys had no concerns with it tilting, the minimal thread engagment was the concern. Has anyone figured out how to tie down the front and rear of a Kayak? If I bring the rope over the bumper to hook up to the frame will it damage the bumper? I'm worried about more than paint scraping. Thanks to the posters for the ideas on how to fix the problem. This Board is great, and thanks for all the great ideas! I took Larry's advice with the Landing Pad 4 "A" plate / "C" plate combo. It worked out great! You can get an "A" plate repair kit from RACKOUTFITTERS.COM for about $14. My TX is a company vehicle that I pay a monthly "personal use" fee for. With the LoadWarrior and extension, I should be able to get most of our camping gear top-loaded. Now my 3 boys won't be strapped in with a full cooler or dutch oven in their lap. We are making our maiden voyage with the rack to Edisto Island in about a week! Gas Economy, as expected, does suffer with the gear basket. I went from 25mpg to 20mpg, immediately. I like the look of the Eye Catchers solution, but I would have been more comfortable with an online offering/info (my OCD drives me to do late night research missions for specs and price checks on just about every purchase). I have attached a picture...thanks again for all the great ideas!! 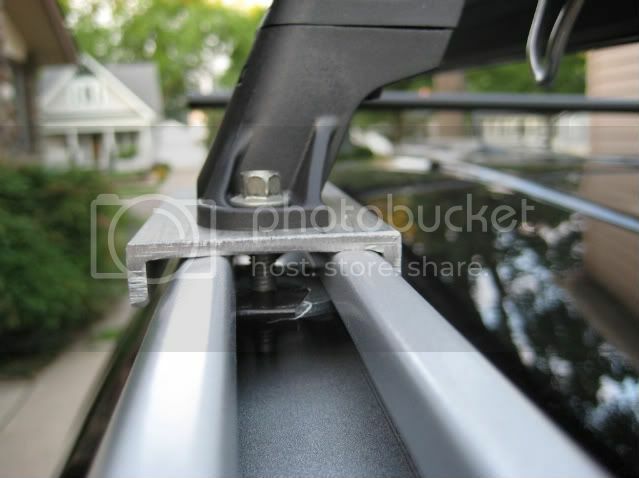 For the raised rail roof rack of the 2008 Taurus X. Eye Catchers offers the 2008 Taurus X Cross Bar Complete kit (2 aluminum cross bars and stainless steel hardware) for $245. 1. Rear bar sits to low near the roof - it is very difficult to even pass the tying rope to secure my load and with heavy load bar is almost touching the roof. 2. Wind noise with your bars is unbelievably loud when driving at 60-70 MPH with no load on them - gives me a headache after 5-10 min;) Keeping in mind that TX has excellent outside noise isolation it makes matters even worse - I do not know where is the problem (any aerodynamic engineers here? ), but most likely that bars are just to low - you need to make landing pad higher. Like a little triangle landing pad with bars rised at least couple inches from the rails. All in all product does the job - I was able to transport my portable boat for couple trips but it definitely needs improvement and at this point I would not recommend for anybody to buy it at suggested price. The lower bars generate less drag than the raised Yakima style, resulting in better fuel economy 3-4 mpg better. Consequently, the natural harmonic of wind noise becomes greater at increased speeds. We have made the raised style, and offer that style, but fuel economy seems to be the driving force for most customers. The yakima style bases also generate a significant amount of wind noise in the TX. The difference in noise between the two styles at 55 mph is 8 dBs. We have tested both styles. I recommend removing the bars of any type when not in use for two reasons, fuel economy and wind noise. I can agree with Chris that fuel economy seems to be not suffering much with low bars - I got about 24.5MPG on my 400 km trip with portable boat on the roof - it is still to little room between the rear bar and the roof. At least 1-2 cm higher would be much more comfortable when securing the load. I had many cars in my life with different bars - no bars were making so much noise:(. Is it more TX problem than bars? I got the X as a company vehicle and was told there was a roof rack. So I go back to get the cross bars and Ford does not offer them. I try to return the car because I go everywhere and talk to all the major rack manufacturers and engineers an they tell me nothing is out there. They tried to sell me on the fact that they had bars for the front two feet and they work fine. Yeah if you only carry something a couple feet long but not a 15 foot kayak....it will just bounce and hit the back of your car roof?!?!? They swore by it but it just makes no sense. Since the fleet company wouldnt let me return it and I am an avid kayaker something had to be done. Easy fix, I took the rack off and using my dremel tool I cut a slot in the plastic (large enough to fit a cross bar clamp) that is on the back portion under the side rails. once that is removed pretty much any rack will work and it does not effect the integrity of the rack. cheaton1 wrote: I got the X as a company vehicle and was told there was a roof rack. So I go back to get the cross bars and Ford does not offer them. I try to return the car because I go everywhere and talk to all the major rack manufacturers and engineers an they tell me nothing is out there. They tried to sell me on the fact that they had bars for the front two feet and they work fine. Yeah if you only carry something a couple feet long but not a 15 foot kayak....it will just bounce and hit the back of your car roof?!?!? They swore by it but it just makes no sense. Since the fleet company wouldnt let me return it and I am an avid kayaker something had to be done. Easy fix, I took the rack off and using my dremel tool I cut a slot in the plastic (large enough to fit a cross bar clamp) that is on the back portion under the side rails. once that is removed pretty much any rack will work and it does not effect the integrity of the rack. Ford might have used the same specs for the TX rack from a rack on a earlier rack that was used and the engineering division never told anyone where the rack specs came from? So the Ford parts division have no way of knowing what fits? I would like to have this resolved by the 1st of Sept since I will be taking a trip the 2nd week and would like to use the roof rack. I used Yakima Lowriders on the open portion of the bar. The bar spread was slightly over 24" which is the minimum suggested for a large Thule box I own. We just drove a 2000 mile trip with the box on top and towed a pop-up camper for 1700 miles of that. We drove 70-75mph and got 22.8 mpg with the box. Adding the trailer we only averaged 16.4 mpg although a lot of that was in the mountains. I'll try and post a picture of the car with the box on top. The box is 91" x 30" x 16" and it and the Lowriders are the same ones I use on my Volvo XC. We had the box loaded near capacity. No problems other than a little wind noise. Sorry - Here's one a little bigger. I'm new to the forums, but want to thank those in this thread, especially Larryqw and tadpole. I have a 2008 taurus x with a nice set of Yakima racks like they suggested in this thread. I used Landing Pad A, Control Towers, 58 inch crossbars, and some faucet washers. Instead of using the c plates that came with the landing pads, I made my own out of 3/8 aluminum, partly because I couldn't find metric bolts long enough to hold the pads on. The ones that came with it are a hair too short. I originally was going to re-tap the stainless plates, but it was easier to just make my own. I carried a 17' aluminum canoe a couple hundred miles camping this weekend without issue. Thanks everyone here for all your help. Ford finaly sells racks for the T/X! 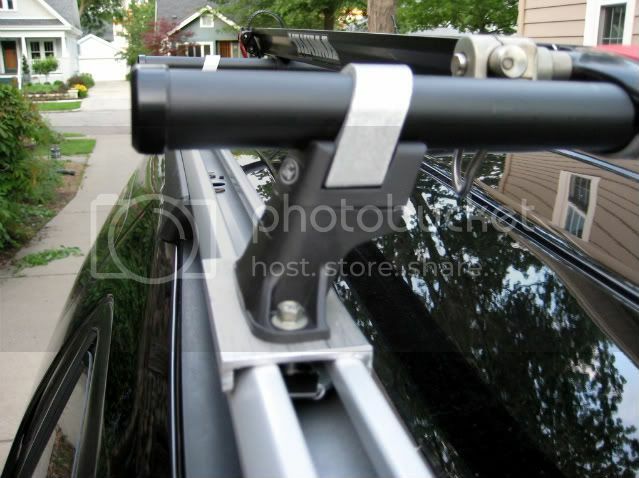 Rail Mounting Kit - 50"
Thule's traditional square bar set up, complete with bars, feet and locks. Great price point! I understand your predicament as I have a Taurus X too and have not found a roof rack. We need to hope someone can come up with feet from a different model that will fit in the X track. 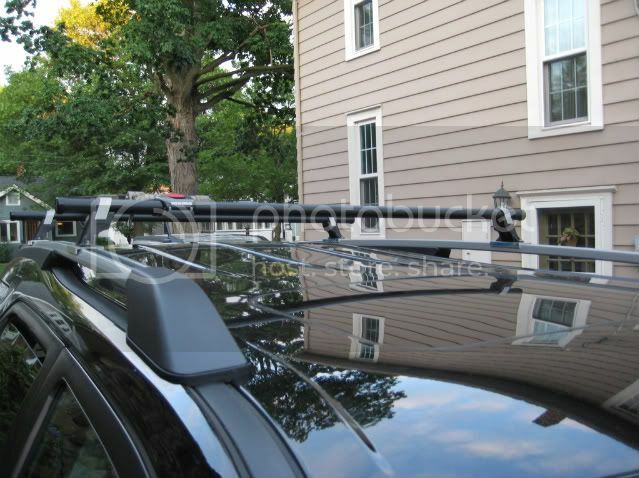 Or maybe Ford uses the same rack on another model that has a roof rack that will fit.